(PhysOrg.com) -- Ever since scientists began studying the brain, theyve wanted to get a better look at what was going on. Researchers have poked and prodded and looked at dead cells under electron microscopes, but never before have they been able to get high resolution microscopic views of actual living brain cells as they function inside of a living animal. Now, thanks to work by physicist Stefan Hell and his colleagues at the Max Planck Institute in Germany, that dream is realized. In a paper published in Science, Hell and his team describe the workings of their marvelous discovery. Hell (which in German means bright) and others at the Institute have been working for years on ultra high resolution microscopes that go by the name "stimulated emission depletion" or STED microscopes. Now, theyve taken their work to a whole new level by cutting away a small portion of a mouses skull and replacing it with a glass window and then placing their latest STED microscope against the glass to peer inside. To make it easier to see what is what, the team first genetically altered the mouse to make certain brain cells fluorescent. Then, to allow for focusing exclusively on just those cells that are lit up, they added software to the microscope to blot out anything that was not lit up. The result is super high resolution real time imagery of the neurons that exist on the exterior part of a living mouse brain. 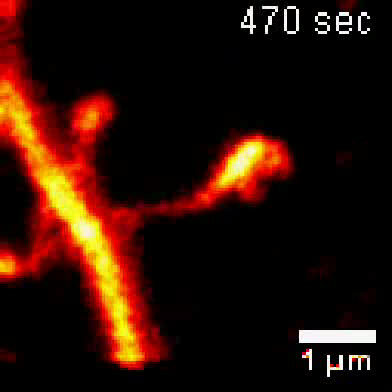 The new microscope provides clear resolution down to 70 nanometers, which is four times that ever achieved before and is enough to allow scientists to see the actual movement of dendritic spines, which may help researches understand why they do so. It is likely that researchers will find many varied uses for the new microscope. One prominent area will almost certainly involve looking into what psychiatric drugs are really doing within synapses, perhaps leading to breakthroughs in pharmaceutical drugs that are better able to target specific illnesses. One downside to any new scientific breakthrough however, is the natural tendency of many to move from excitation, to wondering about what will come next. In this case, Hell and his team have already started contemplating ideas on ways to allow researchers to study any cell in the living brain at such high resolution, not just those that lie on the surface. "Hell" means bright in german (in a visual and also in a 'brainy' sense). The guy's name is Stefan Hell. I cant believe they got a science paper for using already existing technology on the surface of a mouse brain. Yawn. What is the relevance? This teaches us nothing. Hell needs to get backin to asking basic scientific questions. This is exactly the kind of thing that might finally motivate me to change careers and go into neuroimaging/neuroscience. So how bout it Physorg buddies? Should I take advantage of my full scholarship to graduate school and do some good or continue to be a snowboard-bum with a well-paid but unrewarding job? As great as living near 7 ski resorts is, I'm just not sure if I can enjoy a life designing and building TV/wifi networks for rich second-home owners. What exactly is your contribution to science? C_elegans, Galileo used already existing technology (the telescope) to discover Jupiter's moons and solidify Copernicus' heliocentric model of the solar system. You're an idiot.